Disney announced today the global launch of a mobile puzzle game published by Japanese messaging app Line, called Disney Tsum Tsum (pronounced Soom-Soom). The app has been downloaded more than 14 million times just in Japan alone, and Disney is hoping to popularize the franchise all across the world. 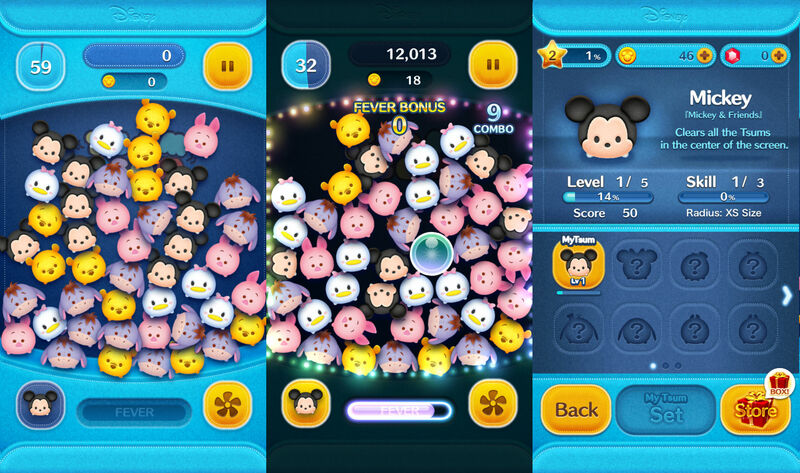 Disney Tsum Tsum, which translates to ‘Disney Stack Stack,’ lets players connect and pop as many of the Disney Tsum characters as they can in one minute. The more Tsums you get rid of, the higher the game score. Players also get to collect Disney and Pixar Tsums as they progress through the game, such as Mickey, Minnie and Stitch. Each one can then be leveled up over time and has a special ability to provide in-game help. The game also lets players connect to a Line account, so they can compare their scores with friends or gift in-app purchases to other players. Other than its core messaging function, Line is also aiming to be a global gaming platform, and Disney’s global launch of the Tsum Tsum game speaks volumes about the popularity of games connected to the chat app. They are also the key revenue maker, typically accounting for around 60 percent of Line’s revenue, though the company didn’t specify the figure in its latest earnings for the first quarter of 2014 that saw it generating total sales of 14.6 billion yen ($143 million).